The first Fireblade were crazy, mad, almost too much for normal mortal. In that time buyers requested raw power and welcomed everything what was increasing level of adrealin. They wanted to be scared. Handling sport bikes in those times , besides a few execeptions, meant that riders had both hands full. Honda decided to go different way, the way of total control. The CBR900RR despite higher price was on the top of selling statistics. Bike with dry weight 185 kg and 893cc engine produced 124 HP, which was power ration 0,67 HP/kg. But what was more important, finally there was a bike available that was as fast as 750cc with the handling of a 600cc. In that time they started to sell knee sliders in larger amounts, which wasn't usual before -finally you could reach by knee the road on stronger bike. Hardly any owner left the bike without any adjusting. Front rotors often broke after 15,000km. Also exhaust muffler didn't last much longer, especially when bike used during the winter and that's why many owners aplyed tune exhaust. Many owners of first Fireblades trimed their bikes with plexiglass, small mirrors etc. 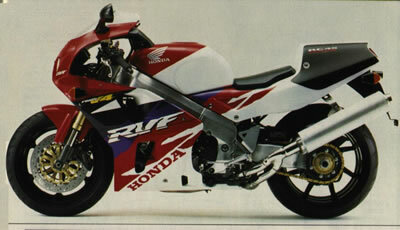 There was so interest for Fireblade than many people got their bike in 1993. Honda succeeded - created a phenomenal bike. In 1993 was changed just color scheme and raised its price slightly.